You are here: Home>Tags>Archive>Bottesford Heritage Archive>Photographs of Bottesford Brickworks donated by Mrs Jean Round..
Photographs of Bottesford Brickworks donated by Mrs Jean Round..
Four men enjoying a break during their work at Challand's brickyard, Normanton Lane, Bottesford. The man at the back of the group is wearing railway uniform and may be a brother of the old of the brick makers. The lad is probably a son. 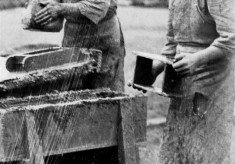 A small set of photographs taken probably in the first years of the 20th century as a demonstration set showing aspects of manufacturing bricks at Challands’ brickworks in Bottesford. 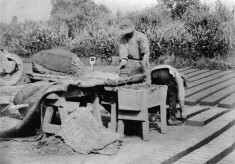 There were two brickyards in the village during the late 19th Century. This one, operated by the Challands family, was located by Normanton Lane close to the level crossing with the railway. 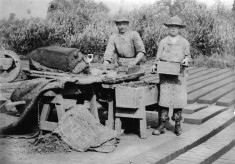 Bottesford station had a coal yard, which would have supplied fuel for the firing of bricks. 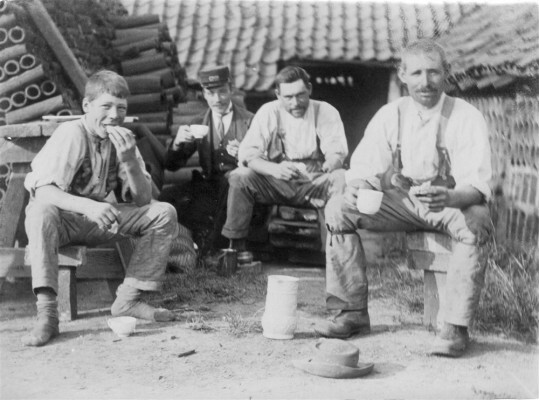 Bottesford’s gas works was located next to the brickyard, with which it shared the requirement for coal supplies. The other brickyard was located on Grantham Road in Easthorpe, owned by the Hoe family, but this doesn’t appear to have lasted past the turn of the century. 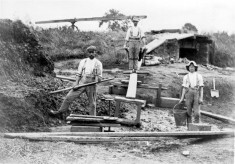 This scene shows two workmen and a boy in the clay pit. Preparing the clay ready to be placed in the wooden mould to shape the brick before drying and firing. Work in Bottesford brickyard. 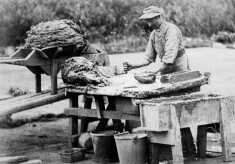 The skilled brickmaker prepares the clay before it goes in the mould. The apprentice looks on. 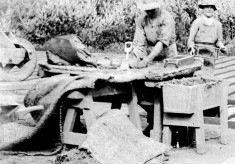 The brick maker throws the clay into the wooden mould. 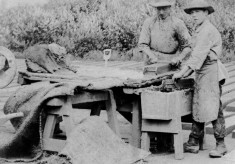 The brickmaker presses the clay into the mould and smooths the top surface. 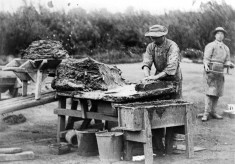 The brickmaker trims the upper surface of the mould using a wooden tool. Finishing the mould before the unfired brick is removed and added to the drying stack. Adding the raw brick to the drying stacks. 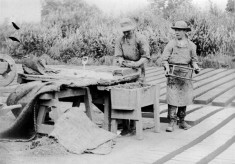 The apprentice places the unfired brick to the rows of unfired bricks laid on the ground to dry. 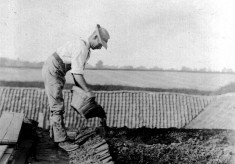 A worker adds earth from a wooden skip to the roof of the kiln. 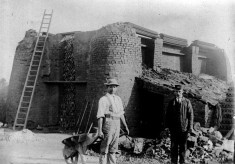 Item: Adding the raw brick to the drying stacks.